We are the leading institutions indulged in wholesale trader & supplying a premium range of Radial Capacitor. Entire range is lauded for its quality, strength, durability and performance. We are instrumental in offering our clients, quality Radial Lead Capacitors. These capacitors are ideal for light duty pulse, logic & timing circuits and lighting applications. Moreover, these capacitors are also used in high frequency circuits and electronic ballasts. A Slovenia based company manufacturing a wide range of multilayer ceramic capacitors (MLCCs). Specially designed capacitors for Electronic Ballast and other Lighting Applications. 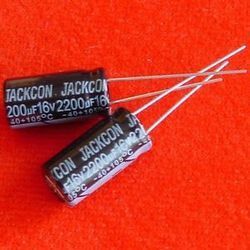 With the assistance of our professionals, we are engaged in offering wide range of Radial Tantalum Capacitors. Our products are used in electronics and electrical appliances. We offer highly effective and quality approved Radial Tantalum Capacitors to our patrons. Moreover, our Radial Tantalum Capacitors are easy to fit and work for a long time.